You heard about Kynoselen… this is the more potent, safer human version! Syntheselen™ is an effective aid in the body’s fat loss, muscle growth and cardiovascular system improvements. It achieves this by stimulating the metabolic oxidation and energy transformation processes. Syntheselen™ is very effective at helping athletes become leaner, by reducing their body fat levels. It also helps build lean muscle mass as well as enhancing energy levels by increasing the athlete’s cardiovascular endurance. Traditionally the overall net effect (synthesis - degradation = + or -) has been understood to depend on what happens in the post exercise environment. What is interesting however and worth spending some time on is what happens to protein synthesis during resistance exercise. Achieving that understanding allows us to move into a new area and explore the concept of energy balance and protein synthesis and thanks in part to recent research examine the specific relationship between ATP concentration and protein synthesis. Energy state in general and ATP concentration specifically is vitally important in the fueling of muscular movement and contraction. ATP is often discussed in the context of sports as a means to reduce fatigue. Yet protein synthesis is an extremely energy demanding process requiring the utilization of ATP. The availability of energy, specifically ATP is a limiting factor in the synthesis of muscle protein. The extent to which protein synthesis will occur is dependant on several factors not the least of which is the availability of ATP. When we engage in resistance exercise we are using energy that will not be available to the components of the system which drive muscle protein synthesis and subsequently tissue accrual. Is it possible to engage in resistance exercise and have net protein synthesis occur at the same time? What has recently been understood? In contrast to protein metabolism in the post exercise environment very little was known about the effect of nutrition on muscle protein synthesis during exercise until the year 2008. Up until that time only two studies had been done and they weren’t even done on muscle. Rather they focused on whole body protein turnover. They reported an increase in whole body protein balance after protein and carbohydrate ingestion during exercise but neither one examined what was happening at the muscular level during exercise11, 12. The Tipton study 12 did go a step further and examined muscle protein synthesis post exercise. This led them to suggest that protein ingestion before, rather then after exercise might better increase net muscle protein accretion during post exercise recovery. The effect of protein and carbohydrate ingestion on muscle protein synthesis during exercise was eventually established in 2008 when Beelen, et al published Protein coingestion stimulates muscle protein synthesis during resistance-type exercise, Am J Physiol Endocrinol Metab 295: E70–E77, 2008. In that study they proved that even in the fed state, additional coingestion of protein and carbohydrates before and during resistance exercise improved whole body protein balance and stimulated muscle protein synthesis during exercise. Although the authors did not specifically frame their results in terms of energy we can do that. Previous studies that demonstrated that resistance exercise stimulated both muscle protein synthesis and breakdown rates found that in the absence of subsequent food intake net protein balance remained negative 1,2,4. Since the Beelen, et al study was published several studies have been published with what appears to be mixed results involving various protocols. The elderly for example have a difficult time engaging protein synthesis no matter what the protocol. A good example of a study that appears to contrast the Beelen, et al study but actually doesn’t when the methodology is examined is Essential amino acid and carbohydrate ingestion before resistance exercise does not enhance postexercise muscle protein synthesis, Satoshi Fujita, J Appl Physiol 106: 1730-1739, 2009. In that study they administered essential amino acids and carbohydrates one hour before exercise and found an increase in muscle protein synthesis which returned to base during exercise. This study underscores the concept of energy inputs driving both muscle contractions and energy intensive protein synthesis and highlights the need to sufficiently meet that energy requirement throughout the exercise period. The most important form of storage for chemical energy in all cells is adenosine triphosphate (ATP). Energy is stored in the chemical bonds within molecules. When bonds are formed potential energy is created and when those bonds are broken energy is released. ATP synthesis in animals requires the absorption of energy from a catabolic conversion of adenosine diphosphate (ADP) and phosphate (Pi) to ATP. ATP synthesis involves the making of new bonds and results in stored potential energy. Cleavage of ATP by breaking these bonds back into ADP and phosphate releases energy. This process is known as ATP hydrolysis. A healthy cell must maintain a high ratio of ATP to ADP (of the order of 10:1) so that it possesses potential energy. If the ratio of ATP and ADP becomes equal (1:1) a stable equilibrium will result with no further net hydrolysis of ATP, which means no more energy release. Almost all energy-requiring processes in the cell are driven, either directly or indirectly, by hydrolysis of one or other of the bonds in ATP, yielding either ADP or adenosine monophosphate (AMP). Healthy cells maintain the reactants and products of these two reactions many orders of magnitude away from their equilibrium ratios. This is why ATP hydrolysis is able to perform useful work when coupled to processes requiring an input of energy. Think of ATP in a cell as chemicals in an electrical battery. The “battery” of the cell is charged up by catabolism which converts ADP and Pi to ATP. The cell holds potential energy and the ability to make things happen such as activating anabolic pathways and facilitating movement and transport processes. Almost all cellular processes require ATP breakdown and therefore tend to discharge the “battery”. For the reason that it is critical to the cell to maintain the appropriate ratios of ATP:ADP and ATP:AMP, complex and redundant mechanisms have evolved to regulate these ratios. ATP directly powers myosin, the muscle protein immediately responsible for converting chemical energy into movement. However, the amount of ATP in muscle is small. Therefore the power output and in turn, the force generated by muscular contraction depend on the rate of ATP production from other fuels. Creatine phosphate (phosphocreatine) can swiftly transfer its high-potential phosphoryl group to ADP to generate ATP. However, the amount of creatine phosphate, like that of ATP itself, is limited. Creatine phosphate and stored ATP are able to power intense muscle contraction for 5 to 6 seconds. A set of weight lifting repetitions will be powered by stored ATP, creatine phosphate’s creation of ATP, and a third process known as the anaerobic glycolysis of muscle glycogen into lactate which generates more ATP. This third process, the conversion of muscle glycogen into lactate, can generate a good deal more ATP, but the rate is slower than that of phosphoryl-group transfer from creatine phosphate. During the first 10 seconds of a set, the ATP level in muscle drops from 5.2 to 3.7 mM, and that of creatine phosphate decreases from 9.1 to 2.6 mM. The third process of anaerobic glycolysis results in the elevation of the blood-lactate level from 1.6 to 8.3 mM. The release of hydrogen ions (H+) from the intensely active muscle lowers the blood pH from 7.42 to 7.24. The power generated during repetitions slows as, creatine phosphate is consumed within a few seconds and the lactate produced brings about acidosis. Thus, alternative fuel processes are needed for continued movement & force generation beyond the maximum time frame of 2 minutes that these fuel processes will be able to power. The next (or 4th) fuel process tapped into is the oxidation of muscle glycogen to CO2 which substantially increases the energy yield, but this aerobic process is a lot slower than drawing directly on ATP stores and creation of ATP from creatine phosphate and anaerobic glycolysis. In a long distance running event this slower fourth fuel process of aerobic respiration, or oxidative phosphorylation, becomes increasingly important. For instance, part of the ATP consumed in a 1000-meter run must because it lasts longer then 2 minutes come from oxidative phosphorylation. Longer distances such as marathon running require further energy conversion methods which proceed to a fifth fuel process known as oxidation of liver glycogen to CO2 and a sixth fuel process requiring tapping into stored energy reserves in adipose tissue resulting in oxidation of adipose-tissue fatty acids to CO2. The significance of mismatching the quantity of energy required to perform high-intensity exercise results in fatigue, or the inability to generate and maintain the desired force output. The significance of mismatching the quality of the energy required to perform high-intensity exercise does not reveal itself straight away. Intense exercise and inadequate or ill-timed nutrition may result in inadequate ATP levels and rationing of ATP usage for protein synthesis unrelated to tissue accrual. Low energy states no matter how they are brought about result in suboptimal muscular protein synthesis. The metabolic system for protein synthesis is the most energy demanding process. It has been shown, for example, that protein synthesis consumes approximately two-thirds of the total energy produced by rapidly growing cells 1. Each step requires the use of ATP. Adding just one amino acid to a growing polypeptide chain requires the energy derived from 4 ATP molecules. 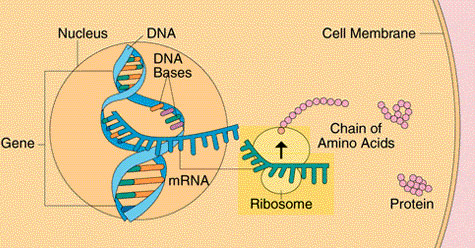 For each amino acid there is usually one activating enzyme and at least one kind of tRNA. 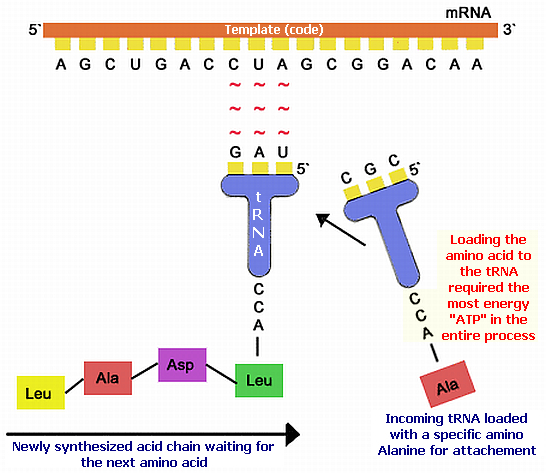 This linking (loading) process occurs for each amino acid that is added to the amino acid chain. From this very basic description it is easy to understand the extent of energy consumption required in the process of linking 40 or more amino acids per second. The entire assembly of individual amino acids as described above, into a polypeptide chain or protein takes place in the ribosomes. So to Dr. Mauro G. Di Pasquale’s list of necessary items: amino acids, specific acetylating enzymes, tRNA, and adequate ATP levels, we can add another; ribosomes. All must be present in sufficient quantities to meet the demands of maximum protein synthesis. During times of rapid growth ATP is maintained at a relatively constant level. However when energy is limited ATP concentrations become very low. It is during these times where the cell must make only proteins essential to its survival. In addition vital processes receive preferential treatment in receiving limited energy. For example, ATP dependent proteases are needed to breakdown intracellular proteins during starvation. This puts a stop on undesirable reactions and provides amino acids for new protein synthesis. This allows the cell to remodel itself in order to survive. During these periods ATP is rationed among energy dependent metabolic processes. This is accomplished by increasing ATP affinity (i.e. attraction) in crucial processes. This allows the cell to preferentially channel energy resources to only those protein synthesis events or metabolic processes it deems vital.3. During periods of high growth the number of ribosomes per cell dramatically increases. Under slower growth rates, ribosome concentrations decrease. A 10-fold decrease has been observed in conditions where energy availability became limited 4. The other factors required for the translation process of protein synthesis are also down regulated 5. There is a direct and measurable relationship between the quantity of ATP and the amount and type of protein synthesis that will occur. Higher, adequate levels precede the type of protein synthesis that leads to tissue accrual and anabolism (muscle protein synthesis). Lower, inadequate levels do not. Note – Many of the statements in the above section were drawn from discussion in the study noted below in reference 5. Exogenous ATP how does it affect the cell? There are three ways that ATP from outside the cell can effect what happens inside the cell. Extracellular ATP can bind to “ATP-receptors” of which there are several subtypes. These receptors reside on the cellular membrane and open ion channels permitting passage of small ions and larger molecules. Extracellular ATP can break down at the cellular membrane into its break down products (ADP, AMP, adenosine and inorganic phosphate) some of which pass into the cell by a specific transporter and are rephosphorated there into ATP. Extracellular ATP can cross the membrane and be taken up into the cell. This claim is still controversial and the mechanism is not precisely known. There is sufficient evidence that this is so and some of that evidence will be discussed herein. No matter which method or methods occur, extracellular ATP does effect what happens inside the cell in ways that can be positive for body building. ATP is naturally present outside cells. Many cell types release ATP, and the mechanisms and physiological circumstances range from relatively well understood to quite controversial. ATP could also be supplied exogenously. One of the ATP receptor subtypes (P2X) is heavily expressed in skeletal muscle1. It has been strongly suggested by the Urano et al study that this receptor may play a significant role in the proliferation and/or differentiation of skeletal muscle cells. There is a relationship between growth factors and ATP that determines whether a cell dies or proliferates. It is only possible for us to get a general feel for this relationship and perhaps the following quotes will help. Although not clearly understood, there appears to be a direct relationship between the concentration of ATP and growth factors that determine the extent to which growth and proliferation or even death occurs. What happens at the macro-level (whole body, what the mirror reveals) regarding energy status and body mass also occurs at the micro-level (cell, what the microscope reveals). In simple terms increased energy input leads to growth while decreased energy states do not. From our previous discussion we know that when the concentration ratio of ATP to ADP drops to a ratio of 1 to 1 the cell loses its ability to channel energy. The “battery” discharges. So for example when we subsequently encounter a study where arrested heart tissue is revived and pulsatility resumed simply by adding exogenous ATP it should not be a mystery. Neither should it be a suprise that growth factor concentration maintains some dependence on ATP concentration, because in general it should just make sense. As can be seen from the following image the act of ATP binding to an ATP receptor (P2X7) has the effect of opening a channel permeable to small ions (cations) or a wider channel permeable to larger molecules (anions). It does so either by conformational change as demonstrated in illustration A or by opening a separate channel as shown in illustration B.
ATP receptors are located in many places such as the pituitary the activation of which can even affect the release of hormones. As an example the following study discovered a relationship between pituitary ATP receptors and the regulation of luteinizing hormone (LH). Luteinizing hormone is a hormone which stimulates Leydig cell production of testosterone. In the study by Chen et al, it was determined that ATP receptors in the pituitary are capable of bringing about the release of luteinizing hormone from gonadotropes when activated by either ATP or a similar nucleotide uridine triphosphate (UTP). UTP is a nucleotide similar to ATP, but with an increased specificity. Both ATP and UTP caused a 14-fold increase in the rate of luteinizing hormone release from superfused cells. They were able to affect this increase by mediating an intracellular Ca2+ inflow into the gonadotrope which apparently released all of the luteinizing hormone stores. It is interesting to note that Ca2+ inflow into hormone-releasing cells in the pituitary is a common release mechanism for various hormones. The hormone Ghrelin and Ghrelin-mimetics such as GHRP-6 operate on GH-releasing pituitary cells in a similar fashion through their own GHS-receptors. Exogenously administered ATP can increase protein synthesis particularly in low energy state conditions. For example protein synthesis is severely depressed in brain tissue following episodes where there is a restriction in blood supply (ischemic episode). Restoration of protein synthesis is essential for neuron survival. In the Paskitti et al 1 study they infused ATP and Magnesium chloride (which stabilizes ATP 2) after inducing restricted blood flow and demonstrated an improved protein synthesis which better preserved neurons. It was an increase in normal protein synthesis that exogenous ATP administration was able to bring about. The trauma of restricted blood flow increased synthesis of heat shock and other stress-induced proteins, along with a severe decrease in the proteins needed to maintain cellular structure and function. Exogenously administered ATP made available ATP which appears to have crossed the cellular membrane and restored a depleted ATP level needed for healthy cellular function and increased overall protein synthesis. The authors ascribed the benefit to ATP directly entering the cell rather then any mediation of ATP receptors or entry of breakdown products. But even if only breakdown products enter the cell the result could be the same. Fedelesova et al 3 noted studies that revealed that administration of ATP into an animal heart had a positive effect on fatigued muscle. One study in particular revived an arrested heart tissue restoring normal pulsation. Another demonstrated that loss of glycogen and phosphocreatine could be mitigated by injection of ATP into the blood stream. While still another restored impaired cellular function and metabolism in the myocardium simply by supplying exogenous ATP. 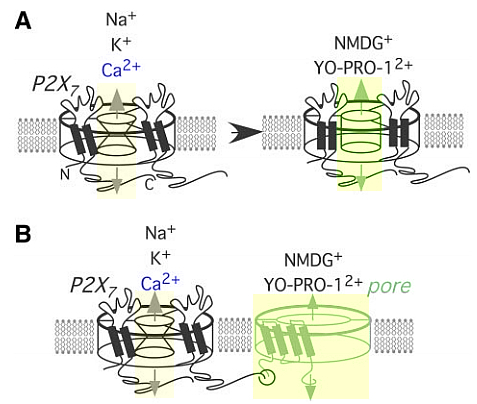 So Fedelesova et al undertook to determine if ATP and its breakdown products were able to enter myocardium cells. Does ATP cross the cell membrane? The original notion that cell membranes are impermeable to ATP came from failing to recognize it as one of the exceptions to the general theory, established in the first have of the 20th century that cell membranes are impermeable to anions (negatively charged ions). In the absence of evidence to the contrary the notion prevailed and continues to this day in part because it is very difficult to measure directly. Many of the metabolic systems that use ATP are located in the cytoplasm of cells, while it is the mitochondria that synthesizes ATP during aerobic oxidative phosphorylation. There is no doubt that ATP is an energy supplier to various intracellular reactions and muscle contraction outside the mitochondria. Consequently ATP must cross intracellular membranes 2-4. Boyd and Forrester showed that ATP was released from contracting skeletal muscle in vitro and then Forrester subsequently showed that ATP was released into the venous effluent from human forearm muscle during performance of isometric exercise 5,6. These results were substantiated by Parkinson in 1973 7 who noted an increase in blood levels of ATP, ADP, and AMP occurring as long as five minutes after whole body exercise. If ATP crosses cellular membranes to leave the cell, does it also cross the membrane to enter the cell? ATP uptake was first suggested and ignored in 1947 when externally added ATP induced contractions in muscle fibers 8. In 1970 it was definitively shown that exogenous ATP entered intact skeletal muscle cells in vitro. Evidence was provided that the labeled ATP present intracellularly was due to the transport of ATP itself from the incubation medium and not due to the formation of ATP from its breakdown products9. These results were confirmed in a follow-up study demonstrating uptake of ATP by soleus muscle and the presence of the labeled ATP intact inside the cell 10. In another study by Ziegelhoffer et al. 11 it was demonstrated that small amounts of exogenous ATP but not ADP or AMP increased the ATP and the total adenine nucleotides of the hypoxic myocardium. Williams et al. 12 were able to show that the addition of ATP but not ADP or adenosine to the medium caused an increase of ATP contents of the cultured myocardial cells. These studies therefore indicate that ATP itself but not its breakdown products increase intracellular ATP levels. A study by Maxild 13 provided evidence for renal uptake of externally added ATP. In that study he concluded that ATP is taken up into the renal cells by the transport system of organic anions. Several studies by Ayad and Hughes 14 lend support. They concluded that ATP enters the cells and acts as a substrate for adenylate cyclase. In conclusion, it appears that ATP can cross the cell membrane. Maximum muscle protein synthesis is achieved only when energy state is sufficient to power vital cellular processes, power the force generation and movement requirements of exercise and power the components involved in assembling amino acid chains. ATP is the energy molecule that makes all of this possible. 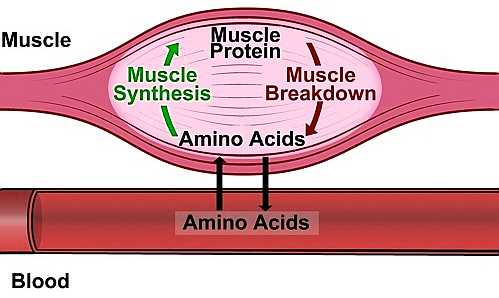 Muscle protein synthesis and resistance exercise compete for limited energy resources. To maximize anabolism it is necessary that protein synthesis occur both during and after exercise. The only way to reduce fatigue and increase muscle protein synthesis is by increasing the level of ATP in muscle tissue. This can be accomplished either by exogenous administration of ATP or by increasing endogenous production. But to minimize fatigue and maximize protein synthesis a strategy that employs both methods is probably optimal. When energy states are low ATP is rationed and the factors required for the translation process of protein synthesis (tRNA, acetylating enzymes, ribosomes) are down regulated. It is during those times that increasing ATP through a vehicle such as Syntheselen™ may be of benefit. In addition during periods when the body is not producing sufficient amounts of luteinizing hormone (a hormone which stimulates Leydig cell production of testosterone) the administration of both Adenosine Triphosphate (ATP) and Uridine Triphosphate (UTP) will result in binding to ATP receptors on gonadotropes. This appears to bring about a release of luteinizing hormone. This action raises the possibility that exogenous ATP and UTP could be utilized as an ancillary during the suppressive events of male hormone replacement therapy and difficult recovery period following hormone replacement therapy. The inclusion of Magnesium Aspartate in Syntheselen™ stabilizes ATP and without it ATP would quickly break down. Heptaminol increases extra and intracellular free calcium ion concentration 1 which should enable ATP and UTP to have a more pronounced effect on Luteinizing Hormone release. As a vasodilator Heptaminol should increase the amount of ATP & UTP available at the pituitary where ATP receptors on gonadotropes reside in addition to increasing muscular blood flow and amino acid & ATP transport and uptake. The anti-fatiguing effect of Potassium Aspartate 2 together with ATP-Magnesium Aspartate will increase productivity in resistance exercise and together with sufficient amino acid ingestion and carbohydrate intake and blood flow result in protein synthesis both during and after resistance exercise.